I'm trying to make two links on the left navigation open up into a new tab as they are external sites. It should be as easy as adding target="_blank" to their HTML element but when I wrote some jQuery to do this task the target gets added to the href of the link but it doesn't do anything to change the functionality. Is there some out of the box solution to making these links go to a tab on a link to link basis? 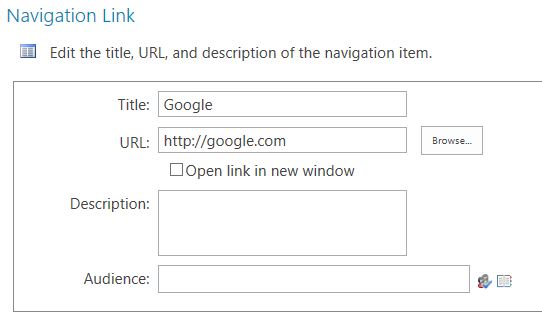 If there is or if someone has found how to make select links open in a new tab either would be much appreciated information. Check open in new tab and its done. How to make global navigation show drop down menu?